The Sisters Rocks are a group of three isolated peaks along the Pacific coast of south Oregon, two still attached to the mainland, the other just out to sea, bordered north and south by smaller stacks and grey sand beaches. 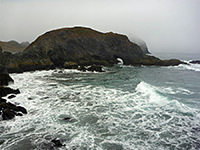 The scenery is typical of most of the shoreline of Oregon and northern California, and like the majority of other locations, the state park is undeveloped and not much visited yet is quite spectacular, even when shrouded by fog, as is often the case. 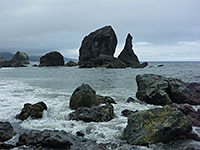 The rocks are part of a minor headland projecting westwards a little way, within sight of the much larger and better-known peaks of Humbug Mountain 7 miles north and Cape Sebastian 20 miles south. Like these two, the area is managed by Oregon Parks and Recreation and accessed by US 101, but is not signed from the highway and has no facilities; the only indication is a generic sign at a pullout beside the road. This short stretch of coastline became a state park in about 2005, partly as a result of lottery funding. 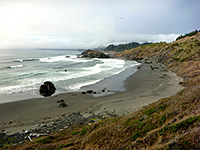 US 101 runs a quarter of a mile from the water's edge on a bench 200 feet above, though a small hill partly obscures the rocks at the closest approach, another reason for the low visitation. Beyond a gate, a disused road leads down grassy bluffs bearing many wildflowers in spring and summer (a large percentage of which are non-native), to a pebble beach at the foot of the rocks, from where other areas can be explored by walking in both directions along the shore. The interesting part extends about one mile, beyond which the adjoining coastline is partly privately owned. Beaches hereabouts have clean sand, no litter, and usually no footprints. Although quite striking, the place is also rather desolate, due to the predominantly cool, misty weather, the dark, jagged rocks and the fierce sea. 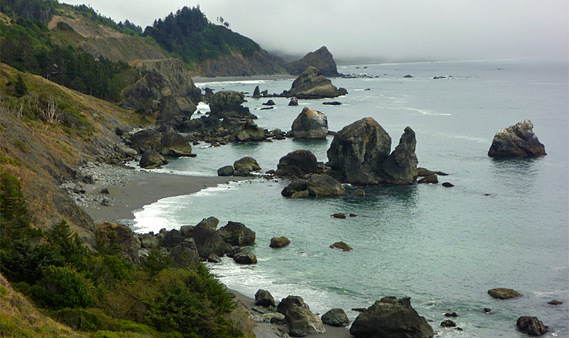 The pull-out opposite the Sisters Rocks is along US 101 between mileposts 314 and 315; beyond is a narrow track, soon fenced off, then a slightly rougher footpath beyond, separated from the highway by a low ridge. Vehicles parked by the gate would be out of sight of the road, so camping may be possible here, while the nearest official site is at Humbug Mountain State Park to the north. There are few buildings along this section of the highway; to the east the land rises towards the coastal mountains and soon becomes thickly wooded. The old road leads down 160 feet over a third of a mile to a low saddle separating the mainland from the nearest rock, and down a little more to a pebble/boulder beach linking with the second, largest rock. The third peak lies 750 feet away to the southwest, separated by open water. All three rocks are steep sided, and mostly sheer around the waterline; they are composed of hard, partly metamorphosed sedimentary strata (the Otter Point Formation). The most notable feature, in the largest, is a sea-carved cave which has at least two small entrances on the south side, leading through to a much bigger hole on the east side, viewable by climbing up the slope a short distance. Most other parts of the rocks are too steep to explore. 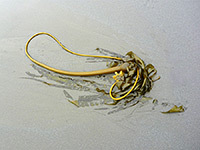 To the south, the closest rock to the land is bordered by a short beach, at the edge of which are a few rusty iron objects and the faint remains of several structures from the old harbor settlement of Frankport, established by gold prospectors in the 1850s. The far end of the beach has some smaller eroded rocks, giving way to a longer sandy stretch with other rocks on the far side, this section beneath a private residence on the bluffs. 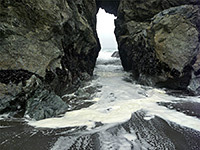 Another dark-colored beach extends north of the Sisters Rocks, interrupted by a group of nicely carved, and more photogenic rocky pinnacles, containing several caves and arches, interspersed by narrow, sandy inlets. 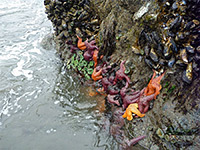 The cliff faces and tidepools are home to the usual range of sea life, most abundant being green anemones, orange, pink and purple sea stars and bluish mussels. Again a house overlooks this section, on the hills just to the east.